At Budget Conferencing we offer meetings on the go – accessible via a conference call app on your iPhone, iPad, Android and Blackberry devices. Download our mobile apps now and sign up for a free trial! All your attendees can join your meeting on GlobalMeet (join us for a free conference call trial) via in an instant. Once you’ve signed up you can downloaded the free app from iTunes or App Store you can then start or schedule a meeting from anywhere at anytime including international teleconferences. Download our mobile apps now and sign up for a free trial! 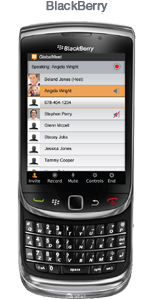 The ability to create instant conference calls is one of the benefits of having an app at your fingertips. GlobalMeet is also accessible on your desktop PC or Mac via the internet and can take up to 125 attendees per meeting. 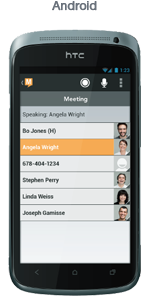 GlobalMeet doesn’t require any conferencing equipment, just your phone. Opt in now for a free conference call trial now on GlobalMeet. The GlobalMeet service that Budget Conferencing offers is based on instant conference calls, all accessible via an online sign up that is fast and easy. You can sign up with your credit card and be holding a meeting with attendees in the space of minutes. 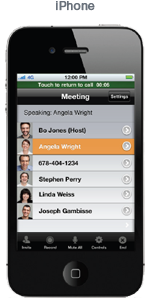 Your conference group can dial in via the app or just dial in with the passcodes provided. Sign up for a free conference call trial. Take a trial on GlobalMeet with our free conference call option and send an invite to your attendees to test out Budget Conferencing’s conferencing services now.